The Tokyo Gas Group believes that the foundation of its CSR activities lies in achieving its public mission and fulfilling its social responsibilities by conducting daily business activities in accordance with its Management Philosophy and Corporate Action Philosophy. To pursue its CSR activities, the Group has determined its key CSR activities, priority issues (materiality) and goals (CSR KPIs). In addition to providing an overview of the Groupʼs CSR management, this report describes in detail its major CSR activities during fiscal 2017, organized under six key CSR activities. 1．In view of the Sustainable Development Goals (SDGs)* adopted by the United Nations, we have included a feature on the Group’s approach to the SDGs and related initiatives. 2．For institutional investors and other experts requiring more detailed information, we have supplemented the description of our CSR activities with a searchable data section. * A global framework for attaining sustainable growth that consists of 17 goals and 169 targets addressing issues such as poverty and starvation, energy, climate change and social peace. The SDGs were adopted at the UN Sustainable Development Summit at the UN Headquarters in New York in September 2015. Production of this report was led by the Editorial Working Group, whose members were selected from each of the company’s divisions and departments. They carefully checked all the information to be published, confirmed the progress of the PDCA cycle in each area of activity, and coordinated all content with the related departments. CSR Section, Corporate Communications Dept. This report contains material primarily from fiscal 2017 (April 1, 2017 to March 31, 2018), with some additional information from other fiscal years. Tokyo Gas Co., Ltd. and its subsidiaries. Tokyo Gas LIFEVAL and partner companies are also included in some sections. 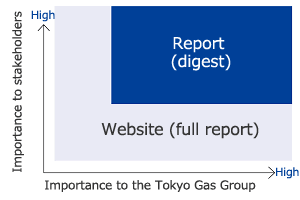 Environmental performance data for fiscal 2017 are for Tokyo Gas and its 46 consolidated subsidiaries in Japan. The environmental performance indicators, environmental accounting indicators, and social performance indicators provided in this report have been third-party assured by KPMG AZSA Sustainability Co., Ltd. (a member of the KPMG Japan group) to enhance the credibility of the data. From FY2017 In principle, the website is updated upon publication of the report during the first half of the fiscal year and with additional information as needed.